We all know that the US is lawsuit territory, but few claims can manage to take your breath away quite so quickly as a recent one that had many so flabbergasted, they had a ‘fly me to the moon, why don’t you?’ kind of reaction. 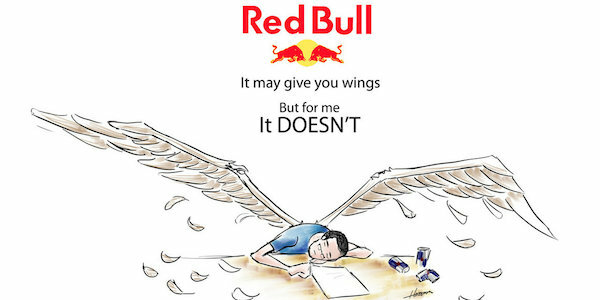 The whole thing involved Red Bull and its famous ‘Red Bull gives you wings’ tagline which has become synonymous with the fizzy drink, supposedly giving you extra energy. One person, though, who most definitely did not, apparently, feel any kind of badda-boom badda-bang whatsoever sued the company for $13-million (some R182-million). The company settled out of court for an unknown figure and subsequently also agreed to pay $10 (about R140) to anyone who bought the drink since 2002. The whole thing is kind of outrageous seeing that it took the said claimant some 10 years of drinking Red Bull to discover, according to him, that it did not, in fact, give you wings, not even the sprouting-from-your-back kind, and he felt very miffed about it. The fact that the company also said it would drop the tagline is sad. People, it seems, will sue over virtually anything, and will also take very literally any claim that you make about a product, no matter how subtle or tenuous the link. South Africa is certainly not immune to this kind of practice and you are very vulnerable in this tough, crazy world in which we live. It pays to have to have the right of protection that is provided by Right Cover when venturing forth with what you think is a great idea, only to have a lawsuit slapped on you for whatever reason whatsoever. You probably would think that whoever is suing you has no chance, but the law may well find loopholes that you never thought of. Ask anyone who has been threatened with a suit and you’ll hear what a terrible position that person feels in, especially when there is a new company, or the launch of a new product is involved. It could set you back a fortune in legal fees, plus see you losing all the ground you have made in the marketplace. Right Cover steps up with immediate professional legal advice the moment you come up with your brainwave and will cover all aspects of your venture, ensuring that you will not fall prey to the many vultures circling overhead. It could be threats of any kind, when you really feel you have no recourse whatsoever, that’s when the professionals step in. With Right Cover, and for as little as R49 per month, you can get access to extremely powerful legal assistance that will help you crush anyone that ever threatens you again. Crush anyone that ever threatens you again by having the law on your side 24/7. Sign up now and make sure you are covered. You must prove to the world that you are not to be meddled with in any way, but you must have the experts from Right Cover on your side. You may not get wings, but you’ll get protection!